Awesome job! Aside from simple paining or swapping parts... I can't bring myself to cut on a figure like that. So funny story. Well, it's only funny cause it worked out. The Goku I bought ended up with TWO LEFT LEGS!! I thought something looked weird, but sometimes the joints aren't positioned just right like with the Legacy figures. Nope. Luckily one store... ONE had ONE Goku left. All is okay. Phew! Wow, yeah that could've been seriously unfunny, had it gone differently. Glad that worked out for you! As for the cutting, I get ideas like that for figures all the time, but nine times out of ten I get the thing in hand and realize that there's no way it would work. I quadruple checked Beerus' arms, before literally slicing them off, and it was absolutely nerve wracking. Once the first arm came together so beautifully though, the second was a snap! I'm lying of course the second was just slightly less terrifying. The swivel works flawlessly though, and feels nearly official, so I'm pleased with how it came out at least! It does look really good though! And I officially have them all. Not opening this one though. Lol! Oh, you have that? I can't tell from the picture, what the heck is the difference between this and the normal release? Is it shading? Yep... that's it. Well, normal yellow hair and shading on the gi. I saw these locally today. Currently, I'm on the fence with them. I was really tempted to pick up the Beerus one, since I do like him and Whis. They are also easier on the wallet. Still, part of me likes the posing of the Figuarts. Argh....I'll need to sit on this for a while. Sounds like we're in the same boat. I worry though that if I wait too long and decide they are something I want, they'll be gone and I'll have to pay ridiculous eBay prices for them. Its funny that you say this..Originally I wanted only Goku's, and if they dont continue this line I wont feel as bad..THEN I saw the pics of Frieza and said ok maybe Ill get Frieza too..However this saturday I found wave 1 at TRU and I started thinking "what if they do continue the line and then by that point wave 1 will be crazy $$"..so I made the executive decision to buy Vegeta and Berus..They may or may not continue the line after wave 2, but at least thats only 2 waves that I invested in and not 10 (looking at you DC Classics).. If your still hesitant on buy them and you haven't bought the Figuarts then I'd pick these up while you still can..
Got a normal Goku, one of his knee joints was so floppy it would drop if I lifted it and let go. Hopefully floor polish will fix it. That would be my feelings about waiting on Figuarts Super Saiyan Blue Goku. So many chances to get it for 30, but I kept saying I had time. Then....price jump. Honestly, part of me hopes that they rerelease him somehow. He's basically the Super version of Super Saiyan, which calls for more products. Here, I'm really just interested in Regular Goku and Beerus. I can't find a standard Goku in figuarts for a good price and I have Beerus and Whis Figuarts on wish lists galore. Well guys, today at work I finally decided I was going to pull the trigger. 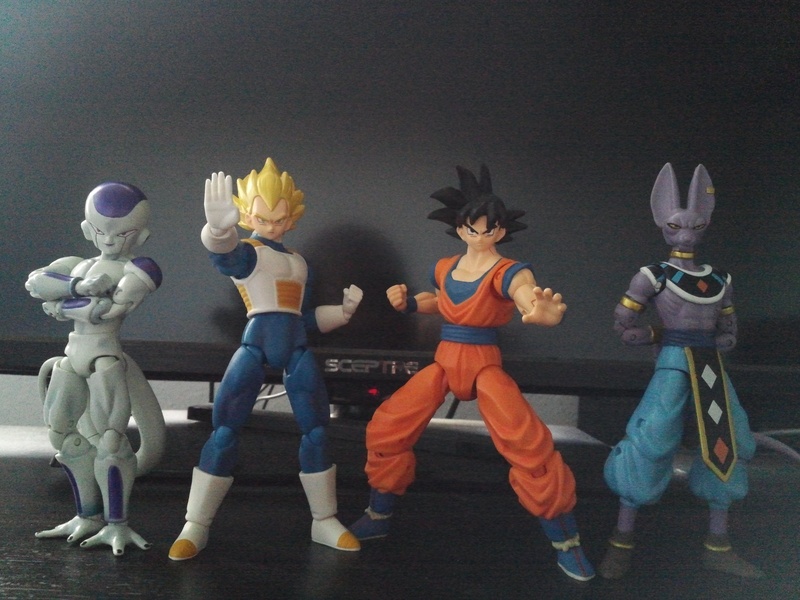 I'm now the proud owner of Beerus, Vegeta and Frieza. I plan on picking up Super Saiyan Goku, Super Saiyan Vegeta and Goku in the near future, but I'm extremely happy with the three that I currently have. I could've had the whole series, but everywhere I checked the three figures I need had some quality control issues going on in the paint department, so I passed on them. (I blame the collector part of me for wanting everything flawless when that's near impossible for mass produced products.) I plan on either going to the next town over this weekend or waiting until I visit my brother in another town in a couple of weeks to see if I'll have any better luck there. I was pretty impressed with the Super Target employee that helped me locate Beerus and Vegeta though. He said he's big into DragonBall Super and loves seeing people buy the figures. He then showed me where future DragonBall merchandise will be going as their store is branching into the collector's market. I feel like I did back in the late 90's, early 2000's with this DragonBall rebirth. I simply cannot wait to see more. Originally I wanted only Goku's, and if they dont continue this line I wont feel as bad..THEN I saw the pics of Frieza and said ok maybe Ill get Frieza too..However this saturday I found wave 1 at TRU and I started thinking "what if they do continue the line and then by that point wave 1 will be crazy $$"..so I made the executive decision to buy Vegeta and Berus. I'm kind of in the same boat as you right now. I still need Super Saiyan Goku from the first wave, but if for some reason I decide not to get the three I still need, at least I'll have Beerus, Frieza and Vegeta. At that point I may just collect the guys that haven't seen much love. I do plan on collecting both waves as of right now, I just need to find figures that meet the quality I expect from a collector's line. I'm really hoping for a solid Whis, Piccolo and Krillin next. I'm sure we'll eventually see Super Saiyan Blue and God variants of Vegeta and Goku if the line continues, but I hope the next few waves are dedicated to some of the other characters. The Lord (Beerus) already knows the market is over-saturated with Goku's and Vegeta's. I really hope they make a first form Cell, he's the only villain I really watched during Highschool when Toonami was showing it after school. Amazon has SS Vegeta and Goku for order if anyone needs them. $17.99 a piece and free Prime shipping for those with the membership. Got Frieza. Really really like him, he moves great and I love his finger pointy hand. Only issue I have is with the tail, it could use some better articulation. Tbh, I'm just surprised with how good these figures turned out. I wasn't expecting them to be this great. So the whole thing about one case being split up between two Walgreen's, I was positive my area didn't have another Walgreen's besides the one I found Goku and Frieza at. So since I didn't see Vegeta, that must've meant someone bought him already. Turns out we do have another Walgreen's, I'm not sure why I didn't remember that, considering I had to go there all the time to pick up medication a few years back. Well, at least I got Vegeta. That's where I got SS Vegeta and Frieza. I'll pass on normal Vegeta, both Gokus and Beerus. Straight from NYCC... at least these four will be next. Or 3... with Fusion Zamasu being the BAF... or BAF parts for him... or something. Sure better pictures and context will surface as the show progresses. Oh hell yeah! Gonna be nabbing all of those, but especially Hit. Man those look awesome....and i love that Black and Zamasu are looming in the display art in the back ground. I so pray that this line performs well! Oh holy hell! I'm so glad I actually decided to start collecting this line! And I know that Wave 2 is just now making its way to store shelves, but I've got to ask, is there a tentative release date for this wave? As for the figures... I could do without the Super Saiyan Blue Goku, but this is a Dragonball line afterall, so I guess it should be expected that he'll probably have a variant in every wave. As for Hit, it's a little head-scratching that he is able to do Beerus' signature pose better than the actual Beerus figure from Wave 1. That Super Saiyan Trunks on the other hand is glorious! Also, I'm only watching the English dub of Super on Toonami and haven't caught up all the way yet, but I'm guessing there's a reason Zamasu has one arm bigger than the other? Hopefully there's a swap-able smaller arm. Last edited by Thunder; October 5th, 2017 at 06:13 PM.